Father Bishoy Aziz Bastawros was born in Fayoum, Egypt on December 12, 1940 and earned a Bachelor of Science degree in Pharmacy in 1962 and an honors Diploma in Industrial Pharmacy from Cairo University in 1964. He practiced his profession for 15 years and served the youth and Sunday School in Fayoum and El Maadi, Egypt. 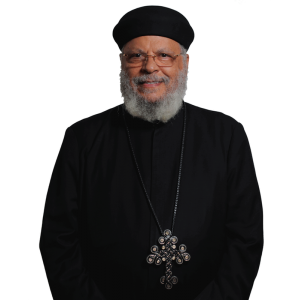 He was ordained as Presbyter by His Holiness Pope Shenouda on May 13, 1980. He served at Archangel Raphael Church in Maadi from 1980-1981 and St. Mark Church in Maadi from 1981-1988 as well as St. Mark Church in Italy. He came to the United States in December 1988 to serve at St. Mary and St. Athanasius Church in Northridge until present. He was ordained to priestly rank of Hegumen on November 18, 1991 by His Holiness Pope Shenouda III. He has been instrumental in building a Senior Citizen’s home and a pre-school program on Church grounds.